2nd Floor, 451 Main St. Choose neighborhood No-fault doctors that provide pain mangement treatment to individuals seriously injured in NJ, NY auto accidents. MSR physicians help people recover from pain and injury after an accident! No-fault law indicates that no matter who is at fault in an accident the insurance carrier of the car you were in will cover your medical treatment. 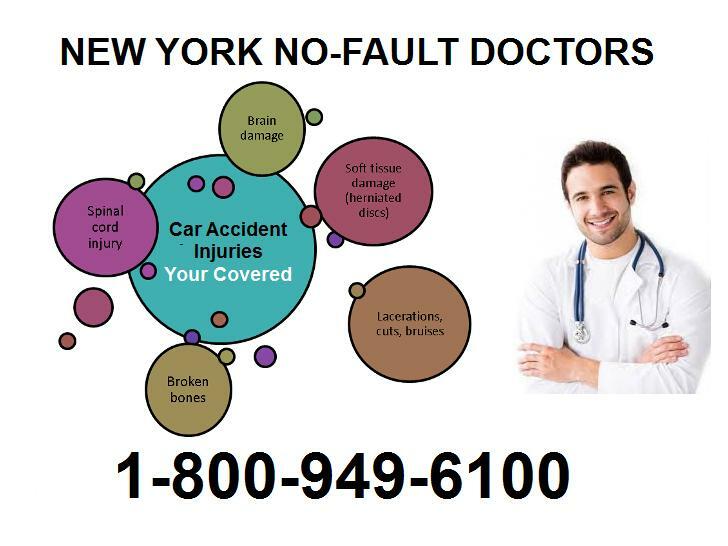 Call today to connect with NY State No-Fault Doctors trained in treating injured accident victims. Are you suffering from neck pain (whiplash), back pain, or fractures after an auto accident? Choose from a network of physicians committed to serving their community as well as no fault patients injured in a car accident. Choose from local accident / injury doctors in New York that specialize in car accident claims. These no fault doctors understand the importance of properly documenting records of your diagnoses and treatment. Choosing the right personal injury doctor is one of the most important steps to take if you've been injured in an accident. Delaying treatment after an injury can give an insurance company reason to deny your personal injury claim. We give you, the patient, access to immediate medical care through New York / New Jersey accident doctors that accepts No-Fault (PIP) personal injury insurance. New York and New Jersey are among twelve US states that accept no fault insurance. New York No Fault coverage allows anyone injured in an auto crash to seek immediate care without worrying about how their medical bills will be paid. New York, New Jersey No-Fault Insurance Accepted!